Tuesday I got a call from Vicki asking if I wanted some freshly ground pork sausage. She and Ronald had a hog slaughtered for their winter store of pork and there was more than enough sausage to go around. They usually sell the excess to their friends for $2.00 a pound and it is already seasoned with spices. Of course I wanted in on that deal and headed right over to get some. Vickie greeted me at the door with a metal spatula in her hand. 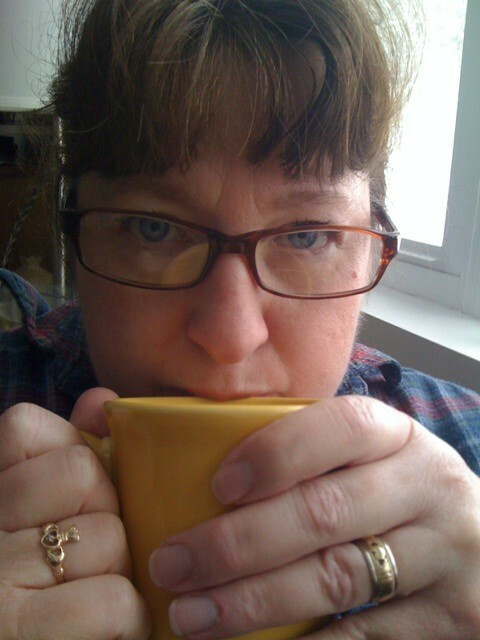 The smell of frying sausage filled the small kitchen and she quickly bustled back over to the stove where sausage patties were frying in two large iron skillets. Rows of pint canning jars sat next to the stove, some already filled with cooked patties. I watched the master at work as she flipped the patties until they were perfectly browned and then placed them into the jars. She poured grease into the jars about a third of the way giving me instructions as she went along. Canning meat was new to me and I knew this was something I wanted to try. She gave me a sample of a sausage patty to make sure it was to my liking. When I took a bite I could taste the freshness and the flavor was mild. This was definitely good and I knew Sonny would like it too. 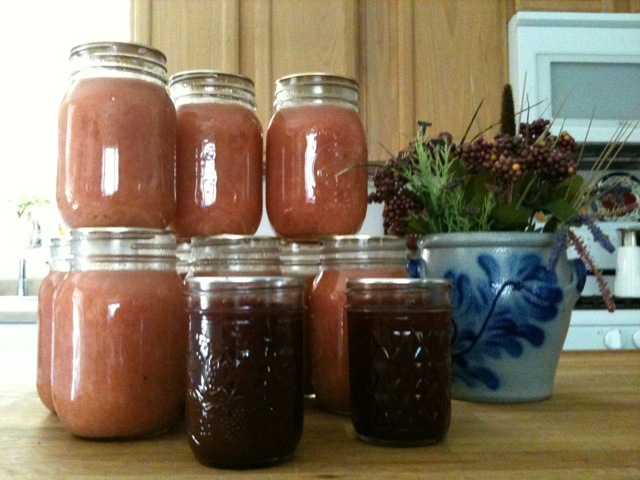 I left with eight pounds of sausage and of course a jar of elderberry jelly that she made this Spring and a jar of sausage patties. You rarely leave Vickie’s empty handed and its hard to give anything back because there isn’t a thing they need. But I will figure out something. The rest of the day I canned sausage patties, but since I didn’t have a lot of fat I added a few cups of water to the drippings and boiled them. Then I poured it in the jars to about a third. Next you pressure cook them for 75 minutes at 10psi. I followed Vickie’s instructions, but I also followed some of the instructions I got from the internet. I made eight pints, but unfortunately two jars did not seal. I put them in the fridge and we will eat them this weekend. The lids were new and I followed the canning instructions so I think they may have been a couple of bad lids. Sometimes that happens. 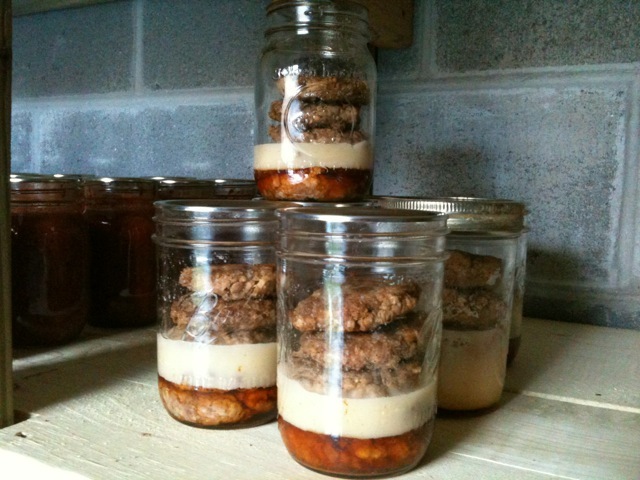 You just have to make sure to refrigerate those jars and use them within a week. The root cellar is starting to look like a root cellar with all the pretty jars on the shelves. 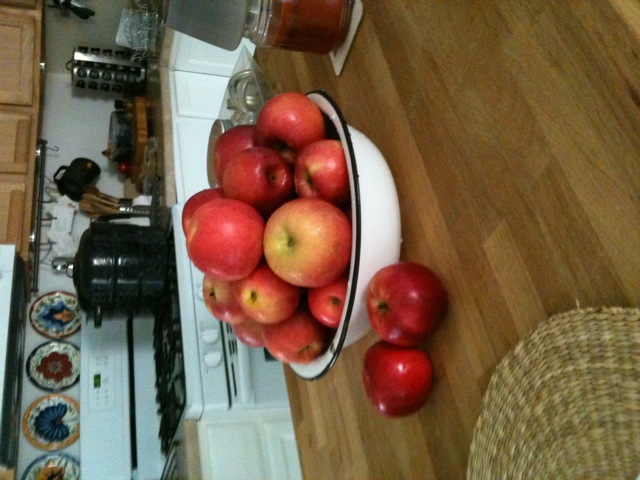 When my sister visited I asked her to bring me some more apples. Sonny likes the apple sauce we canned on her first visit, so we canned up some more. This time I made it slightly chunky instead of smooth. We haven’t tried it yet so we’ll see which one he likes better. We have two trees next to the house that tend to block sun from a portion of the PV Array every afternoon. We can’t afford to lose any of the suns rays and need all of them to charge the batteries. Those trees have been a constant thorn in Sonny’s side and he has been chomping at the bit to do something about it. This could be a tricky operation. The old apple tree would be easy to cut down, but the ancient cedar is another matter. Its large and twisty and you cant tell which way it might fall. It could potentially fall on the house, so Sonny opted to cut only the branches that cast shadows on the solar panels. This was a job that called for reinforcements. Rick and my cousin John volunteered to come to the front lines. They cut the apple tree down first, and cut the branches and trunk into firewood. My sister Janice and I loaded the wood into the wagon that was attached to the lawn mower and transported it to the backside of the woodshed. There we unloaded and stacked it to cure. On the trips back she and Ruby, our Lab rode in the wagon. I wish I had gotten a photo to post but unfortunately I didn’t. When I was little she used to give me wheel barrow rides for hours, so it was my turn to give back to her. Your never too old for a wagon ride. It beats walking back and forth. 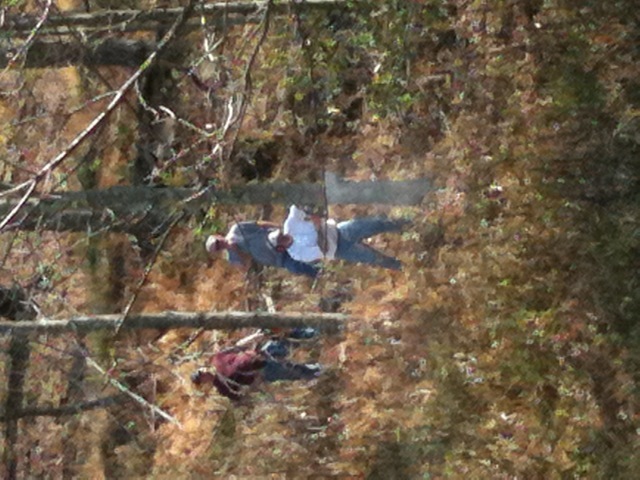 Next the guys tackled cutting down three trees on the hill across from the house. They left enough of the trunks so they could be used as fence posts. Next year we want to fence in that pasture for some goats. 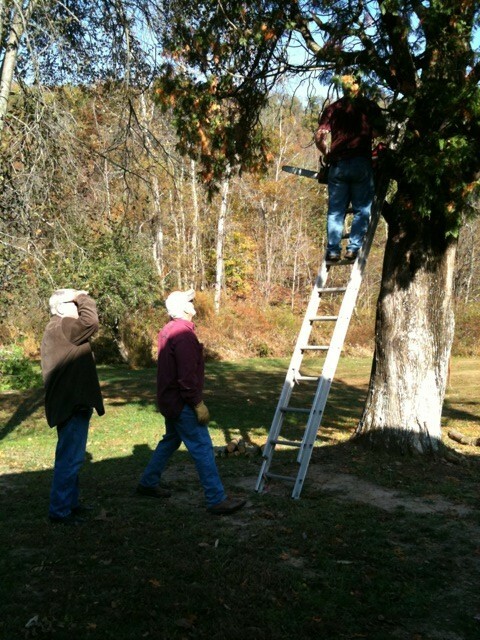 The men had been working hard but did one more chore before quitting time. 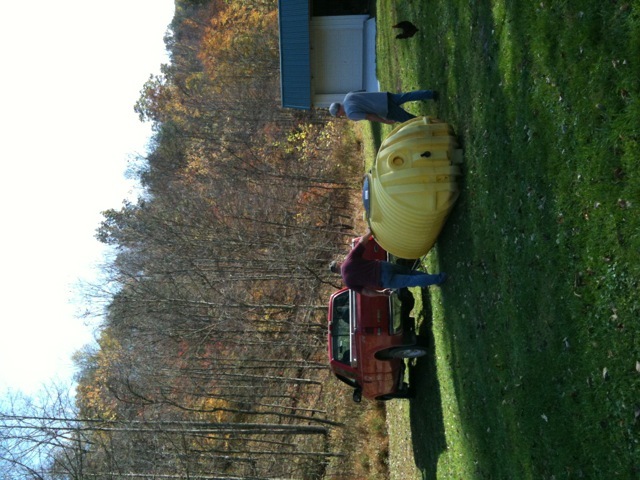 They pulled that eyesore of a water tank to the backside of the chicken coop. Last year when we had a big rain the tank didn’t have enough water in it and it popped out of the ground. It was actually a good thing because we found out we don’t need it. We can pump water directly from the well. I have to say I have a great brother-in-law. 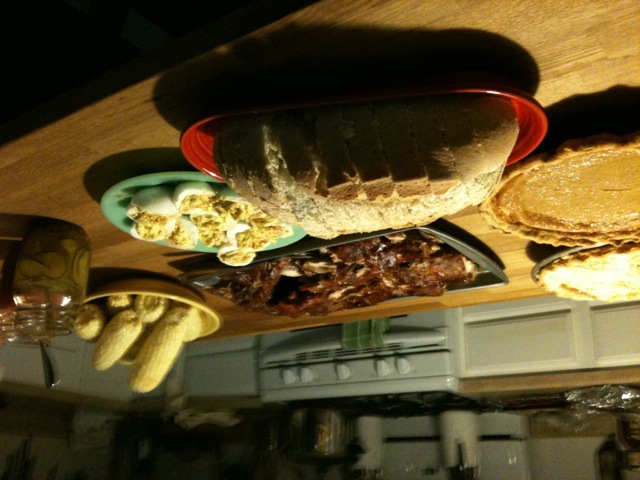 He not only worked all day cutting wood, he made some outstanding ribs for dinner. My sister made a good choice some thirty- seven ( I think ) years ago. He’s always been ok in my book. Hope he enjoyed his visit to PHF and comes again to the backwoods of old West Virginny. Oh, and that cedar tree? It’s still casting some shadows. Unfortunately the limbs are too high and dangerous for Sonny to cut. We will have to get a professional to do the job. 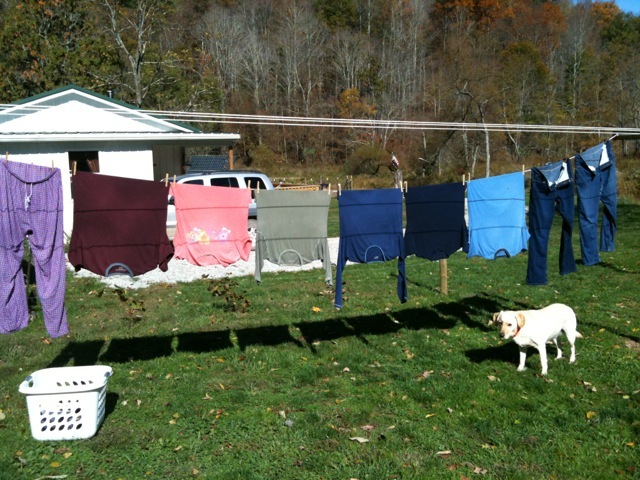 I would rather have my cloths dried on a line then a dryer any day. Carol called me Sunday morning and asked if I wanted any pears. I gave her an emphatic affirmative. Are you kidding? Pears! In this neck of the woods you don’t pass up anything that can be put up in your pantry. Ronald and Vicki had picked pears at a friends farm and had a load of them. She worked up (canned) all that she needed and asked if Carol and I wanted what was left. So Carol and I rode over to Vickie’s to pick them up. She had two or more five gallon buckets filled to the brim with golden pears. They were ripening up pretty fast since they were picked the week before. Vickie also had two large Cushaw pumpkins for me. She said she had enough canned to last them for two years and didn’t care if she saw any more pumpkins until then. I was glad to take them off her hands and appreciate being able to put more pumpkin in our root cellar. Carol and I decided to work up our pears yesterday and Vickie said she would be glad to help. With that many pears to peel and cut up an extra pair of hands are always welcome. We didn’t get started on them until afternoon because I had to take the forty pound propane tank for the generator to be exchanged in town. Of course a trip to town takes all morning, but I hurried as fast as I could. We girls had a great time while we peeled and cut. Vicki kept us entertained with conversation. John went to visit his friend Gary who lives down the road a piece. I guess he wanted to get away from the cackling hens. 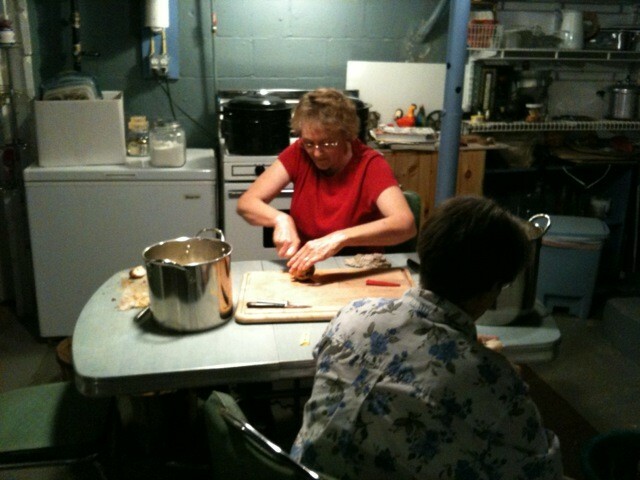 Carol has a nice area in her basement with everything needed to do canning. 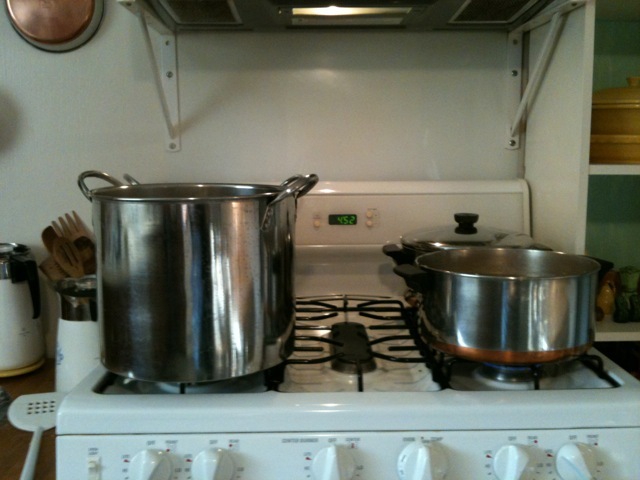 It helps to have an extra stove and all the large pots. We worked at my grandmother’s old aqua colored Formica table from the early 1950’s. I have many fond memories of sitting at that old kitchen table with my grandparents. 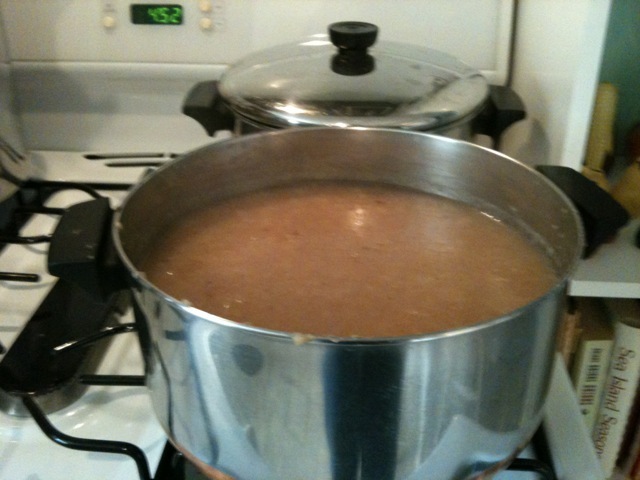 We decided to make pear sauce (which is like apple sauce) because the pears were so ripe. We had three pots of pears cooking down on the stove. I think we added a bit more water than needed and it took longer than expected to boil them down. We actually strained out some of the liquid to save time. The sauce was pretty tart so we added some sugar to sweeten it. We put up about sixteen pints of sauce and Carol made pear butter (something like apple butter) from the liquid we strained off. Nothing from the pears was wasted. The chickens enjoyed a pan of scraps and the rest went into the compost. When I open a jar of pear sauce, I’ll have warm memories of time spent with good friends. As I open the lid the sound of tinkling voices, laughter and the sight of smiling faces as our hands busily worked will come to mind. That’s something you can’t get from a factory packed tin can. 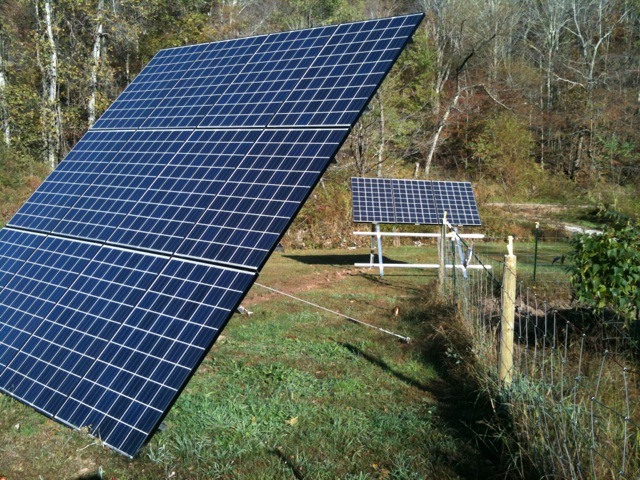 Last month I ordered 3 additional 210 watt Kyocera PV solar panels as part of my stage 2 upgrade. I promptly ordered a 6 panel rack mounting system through Alt-E Solar Store but then had to wait over 4 weeks until DPW (the manufacturer) shipped it. John and I decided to start the project first thing Saturday morning (right after a cup of coffee). The first action was to get to town to hit up Lowe’s for installation supplies. PVC conduit, 10 and 8 gauge wire, ground rod and clamps and of course some lunch and we were ready to finally get started around 2:00 p.m. About 4 hrs later we were covering up the trench and flipping the disconnect to “on”. We set these panels to face South-East to gather the early morning sunlight before my main PV array even gets any sun on it. The “Rack Mount” is designed for 6 panels and soon we intend to add another 3 panel on the bottom to close-out the install. If all goes well it will happen sometime next month. 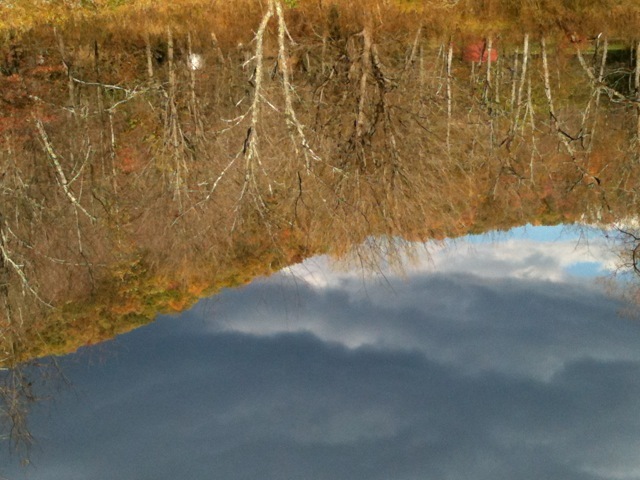 You are currently browsing the Off-Grid in West Virginia blog archives for October, 2010.